Written by Mark Rejhon (aka Chief Blur Buster) originally in 2013. Edited for 2019. OLED has been regarded as a Holy Grail for eliminating motion blur. Unfortunately, not always: The portable Playstation Vita, and the iPhone X and Samsung Galaxy still have lots of motion blur during fast scrolling animations. They are not low-persistence OLEDs. The answer lies in persistence (sample-and-hold). OLED is great in many ways, however, many of them are hampered by the sample-and-hold effect. Even instant pixel response (0 ms) can have lots of motion blur due to sample-and-hold. Some OLEDs use strobing for lower persistence, to eliminate motion blur, but not all of them do. Vertical axis represents position of motion. Horizontal axis represent time. Middle image represents flicker displays, including CRT and LightBoost. Right image represents sample-and-hold displays, including most LCD and OLED. The flicker of impulse-driven displays (CRT) shortens the frame samples, and eliminates eye-tracking based motion blur. This is why CRT displays have less motion blur than LCD’s, even though LCD pixel response times (1ms-2ms) are recently finally matching phosphor decay times of a CRT (with medium-persistence phosphor). Sample-and-hold displays continuously display frames for the whole refresh. Persistence (sample-and-hold) is a different measurement from pixel transitions (GtG). As a result, a 60Hz refresh (even on “2ms GtG” LCDs) is displayed for a whole 1/60th of a second (16.7ms persistence). Motion blur occurs on the Playstation Vita OLED even though it has virtually instantaneous pixel response time. This is because it does not shorten the amount of time a frame is actually visible for, a frame is continuously displayed until the next frame. The sample-and-hold nature of the display enforces eye-tracking-based motion blur that is above-and-beyond natural human limitations. An excellent web-based animation of sample-and-hold motion blur can be found via the Blur Busters UFO Motion Tests: Eye-Tracking Motion Blur Animation. This is motion blur from persistence. Thin lines: Stare at the stationary UFO. Thick lines: Stare at the moving UFO. This is because eye-tracking causes the vertical lines to be motion-blurred thicker, solely by the motion of eye tracking. Another good animation is TestUFO Persistence and additional tests at TestUFO Eye Tracking. Pixel response speed cannot fix this problem alone, without using strobing/flicker. Therefore, even 0ms GtG can have lots of motion blur. The only way to reduce motion blur caused by sample-and-hold, is to shorten the amount of time a frame is displayed for. This is accomplished by using extra refreshes (higher Hz) or via black periods between refreshes (flicker). Some experimental OLED televisions now shorten frame sample lengths by strobing the pixels, and/or motion interpolation (extra refreshes). Motion interpolation can interfere with video games due to input lag. Fortunately, impulse-driving (flicker) is video game friendly. Here are diagrams of how rolling-scans can eliminate motion blur. This technique can actually be done laglessly, unlike LCD-monitor-based motion blur reduction (e.g. ULMB on LCDs). Since it’s a rolling scan, the panel scanout can still stay virtually laglessly in sync with the cable scanout (HDMI, DisplayPort). Whereas existing global-strobe backlights (ULMB, LightBoost, etc) in modern gaming monitors requires scanning out the LCD panel in the dark before flashing the backlight. So there will be no input lag disadvantage for OLED-based rolling-scan motion blur reduction! 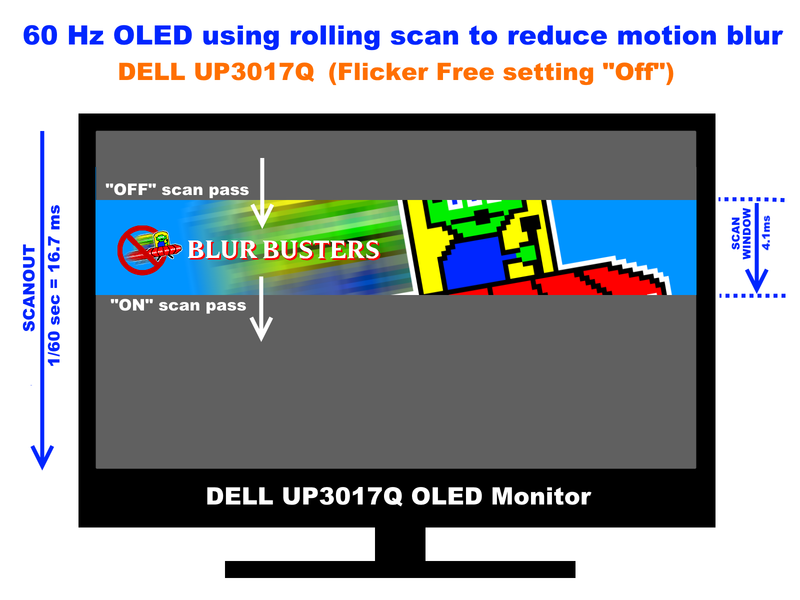 Regardless, reduction of motion blur is why many LCD-based HDTV displays now use motion interpolation and high refresh rates, as well as using scanning backlights. In addition, some new 120 Hz gaming computer monitors now have a strobe backlight feature such as LightBoost, which allows these LCD’s to have less motion blur than sample-and-hold displays (including the PS Vita OLED). One big problem to overcome first, is that impulse-driving require a lot of brightness to compensate for extra black period between refreshes. OLED has historically had brightness problems, however, researchers are continually improving this. Today, Oculus Rift and HTC Vive virtual realty headsets now already achieve CRT motion clarity via their pulsed rolling-scan technique. 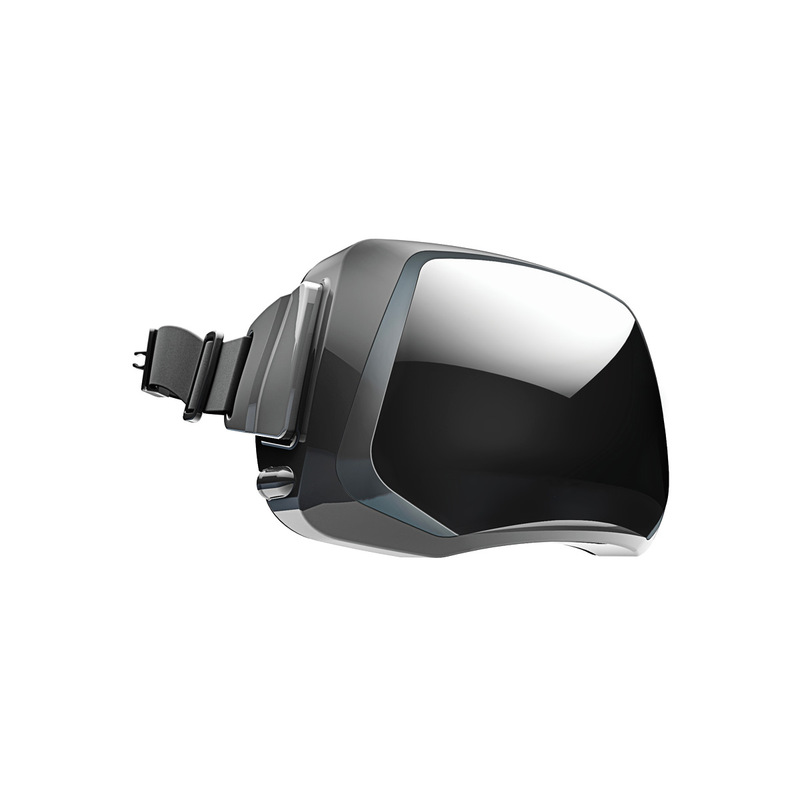 Most VR headsets need to eliminate display motion blur, to avoid nausea in virtual reality. Some 2018 and 2019 OLEDs such as LG HDTVs have a black frame insertion mode. Newer OLEDs are having longer black frame intervals with shorter refresh cycle visibilities, to keep reducing OLED motion blur, especially as OLEDs get brighter with enough headroom for motion blur reduction. We need an optional low-persistence mode even for ultra-high-Hz OLEDs too such as JOLED’s upcoming eSports gaming OLED monitor. Although doubling the refresh rate will halve motion blur, it is still necessary to use impulse techniques to reduce motion blur further. For more reading on display motion blur behaviors and example animations, see Blur Busters Law: The Amazing Journey To Future 1000Hz Displays. 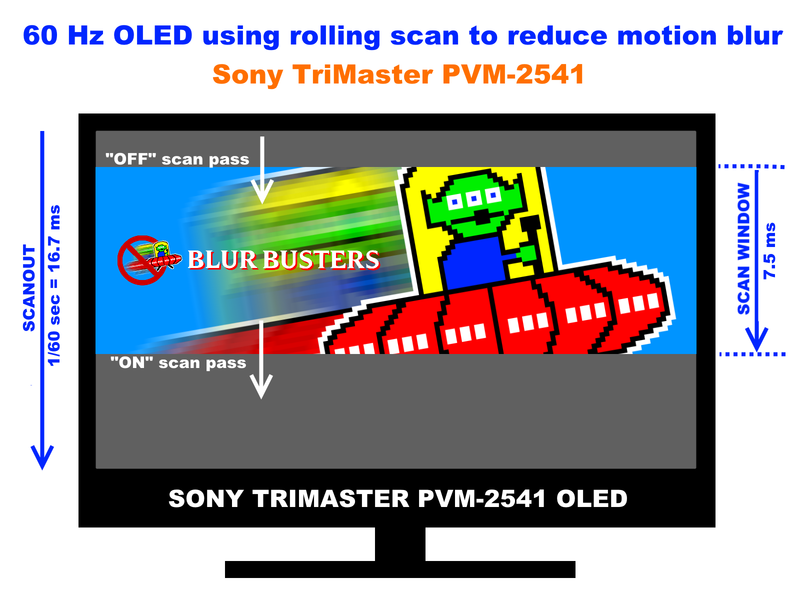 Recently, several researchers (Hiroyuki Ito, Masaki Ogawa and Shoji Sunaga) have published OLED responsiveness findings about the Sony Trimaster PVM-2541, a Sony OLED display targeted at the professional markets. This active-matrix OLED is impulse-driven at 7.5 milliseconds per pixel via a rolling scan, and has roughly equivalent motion blur as 120Hz non-LightBoost computer monitors, and LightBoost still outperforms OLED with as little as 1.4 milliseconds of measured motion blur (see 60Hz vs 120Hz vs LightBoost). As of 2013, most strobe-backlight gaming monitors today (see List of 120Hz/144Hz Monitors) has lower persistence than OLED. As shown in this chart from the scientific paper, “Evaluation of an organic light-emitting diode display for precise visual stimulation“, the graph shows this specific Sony OLED has slower response than CRT, with more motion blur. Currently, the best plasma displays and best LCD displays can outperform this specific OLED in terms of motion resolution. This may be a design decision of a balanced compromise between flicker, brightness, and motion blur. Future OLEDs may provide an adjustable black period for an adjustable trade-off. Information about frame rate conversion, that also explains how eye tracking produces perceived motion blur on a sample-and-hold display, including explanatory diagrams. Covers the relationship between human perceived motion blur versus Motion Picture Response Time (MPRT) of the display. This also accounts for motion blur caused by eye tracking on a sample-and-hold display, a separate factor than pixel transition speed. This is an older 2006 paper that explains how scanning backlight can help bypass much of an LCD panel’s visible pixel transition speed. Page 4 has very useful motion blur diagrams, comparing sample-and-hold versus impulse-driven displays. Section “3. Perception of Displays” (and Figure 1) explains how LCD pixel response blur can be separate from hold-type (eye-tracking) motion blur. Many excellent graphics and diagrams of motion blur, including impulse-driven and sample-and-hold examples. Background information that relates to how flicker becomes a continuous image (applies to CRT and to scanning backlights). Background information that relates to human vision behavior and how multiple flicker events, over a short interval, blends together. More references can be found in Science & References. High Speed Video of LCD versus CRT. This article is featured in a LinusTechTips video! Blur Buster is mentioned at about ~4:30, and the website at about ~4:50. Oculus’ prototype prototype Crystal Cove OLED VR goggles is confirmed to use strobing to greatly reduce persistence.